A media centre PC combined with a 32-inch LCD HDTV could be the perfect solution for today's home, but it's a lot to get right. Attempts to merge the PC and TV haven't usually worked well, with too many compromises on either side or a price tag that makes buying both separately look cheap. Can Packard Bell do any better? The Smart TV 32 confidently combines a well-specified Windows Media Center PC, using Intel's Viiv multimedia platform, with a 32-inch HD Ready monitor. Despite fitting neatly inside a TV shell that's only slightly bigger out back than you'd expect, the PC uses mostly standard PC components, so upgrading the memory, processor, hard disc or graphics shouldn't be too hard. A notable innovation is the 'gyroscopic' remote control, which controls the cursor instead of using a mouse, as well as having all the relevant AV control buttons. A wireless mouse and keyboard are available too. There are inputs for almost any peripheral or memory format, plus wired and wireless networking and inputs for the analogue and digital TV tuners. However, there's no card reader or common interface slot for upgrading your Freeview with Top-Up TV's channels - even though, as an IDTV, it should have one under EU regulations. The 1,280x768 monitor is equipped with HDMI and Scart inputs that are independent of the PC, but you'll still have to turn on the PC to use the screen. This doubles power consumption even if you don't want to use the Media Center's tuners, DVD or recording facilities, although you can power down the PC to a limited extent. In fact, booting up is a major issue for anyone who wants to start watching TV or DVDs in a hurry, since it takes a couple of minutes to start up. That said, it's instantly ready to go when it boots up, with software including Norton Internet Suite, Power DVD, and Skype, plus the built-in playback, TV viewing and PVR components of Windows Media Centre, which includes a full EPG. It's easy to tune in analogue and digital terrestrial TV channels, or integrate a cable or satellite box using the IR relay. Recordings are easy to set up and you can also time-shift, but for external sources the quality is disappointing; you're limited to composite and S-video inputs because the US-sourced video input equipment doesn't cater for Europe's RGB Scart option. There's no support for Freeview interactive applications using MHEG-5, as a PC with broadband has more interactivity than any set-top box - but that does mean you won't be able to enjoy the extra video streams often supplied by the BBC. It's a shame that no one has come up with an MHEG-5 emulator. The 2.8GHz Pentium D processor and 1GB of RAM are up to most AV tasks, including HD playback of downloaded clips, and it's quick to respond for time-shift and recordings. 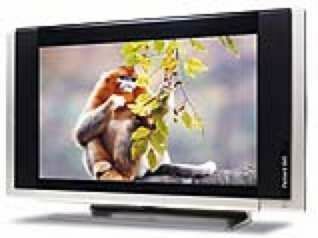 Sadly - and despite the package's £2,000 price tag - the screen itself is the Smart TV 32's weak link. Compared with a reference Sony Bravia, it lacks fine detail and is particularly murky and low on detail in shadowy scenes. PC playback modes also suffer from panning and scrolling judder, because the video card is set at 60Hz, but UK TV and DVD sources play at 50Hz - and there's no way to alter this. The onboard 10W per channel audio is purely functional, flat, and lifeless and has limited range. Better results are obtained with the 7.1 analogue outputs or digital audio out.